Prepare to turn some gears, as long as you don't mind paying in chunks. Chillingo has a ton of addictive games for both the iPod Touch and iPhone. Yesterday, it was Guerrilla Bob making a ruckus. Today, it's Leonardo da Vinci. Well, OK, not him directly, but a puzzle game inspired by the great inventor. 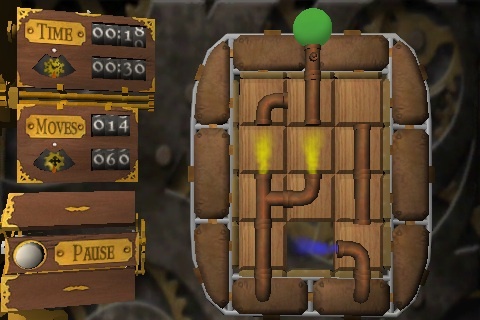 Cogs is a one-of-a-kind puzzler that'll keep you entertained, just as long as you don't mind plunking down a few bucks for the full game. Cogs has an interesting price structure. The game sells for a dollar, and gives you ten puzzles and twenty challenges to complete. From there, you'll need to pay an additional dollar for each separate pack, with four offered in all. This isn't a deal breaker by any means, as you'll receive the full game for a reasonable five bucks. If you can accept this, Cogs has plenty to offer. This is a traditional tile-shifting game, where you align cogs to operate machinery. You'll need to align them just right and, in some cases, do so on time. For instance, one stage features a music machine where you need to hit the tones in the correct order. To do this, you'll rearrange the cogs for the first tone-maker, and then set up the other one. Practice makes perfect in this game, and the various stages will tax your brain. The later ones become mind-bogglingly hard, and there's no easy solution, so you'll really need to sit down and think them through. The first few levels start on a 2-D plane, but soon you'll deal with fully interactive objects with multiple sides. This is done through beautifully rendered 3-D, moved around by swiping two fingers on the screen. Along with the traditional stages (in Inventor Mode), there are also more challenging configurations to figure out in Challenge Mode. Furthermore, you can earn Achievements and show them to others through the Crystal system, which works on a similar level as OpenFeint. There is no direct online play, but this game doesn't really need it. Presentation really goes a long way in Cogs. As we stated, the in-game objects are wonderfully designed, as if they came out of da Vinci's basement. The menu system is equally great, with wooden boards and shifting tiles. We like the in-game music, with its unique string arrangements and soothing tones. The sound effects are authentic as well, with gonging bells, turning cranks and even an old-school jack-in-the-box. We haven't seen one of those in years. 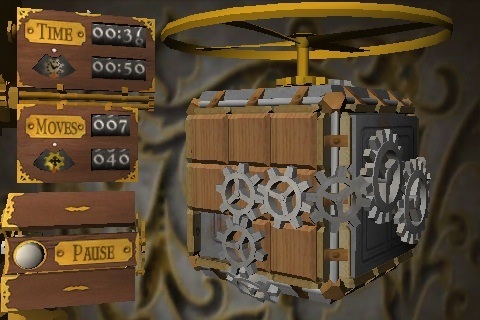 If you can get past the game's "buy as you go" set-up and increasing difficulty, you'll find tons of value in Cogs. The presentation is top-notch and the gameplay will grind your gears, and we mean that in a good way. What's Hot: One of the best looking and sounding puzzle games we've seen on the iPhone, classic tile-shifting gameplay gets better with each stage, Inventor and Challenge modes will keep you busy. What's Not: You have to pay to unlock additional content.